Ladies and gents it is with a heavy heart I make this announcement. Tom Arena , friend and loyal son of NJ Proghouse and other progressive music events etc. has unexpectedly passed on while in surgery yesterday. Tom was at many a Proghouse show over the years. I was always glad when I would see him cruise through our doors wherever those Proghouse doors may have been. He will be missed. As he shuffles of this mortal coil please play a song in his honor today. 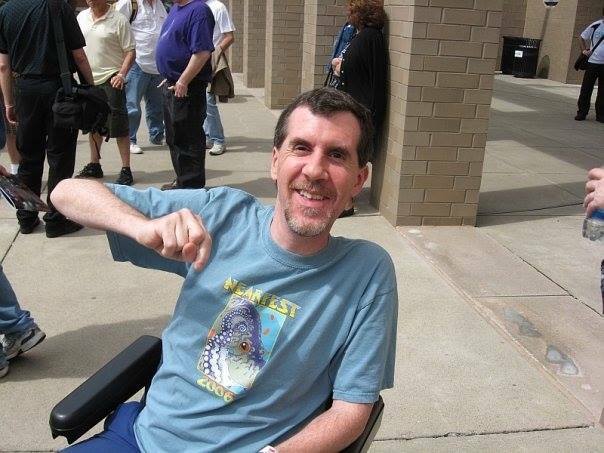 Thomas Joseph Arena Dearest son, brother and uncle, led MDA chapter, 46 Thomas Joseph Arena, 46, passed away Sept. 17, 2014. A memorial Mass is at 11 a.m. Saturday, Sept. 20, at St. David The King Catholic Church, 1 New Village Rd, Princeton Junction, N.J. 08550. The youngest of four brothers, Tom has a special place in everyone’s heart. He vigorously fought his whole life from the debilitating disease of muscular dystrophy. A dedicated volunteer for the MDA, for years he assisted in running a telethon call center for the annual telethon. He also was president of the Northern NJ chapter for several years. Tom’s interests included camping with his brothers, the movies, the NY Yankees but mostly music. He was an avid blogger who would write reviews of albums and concerts he would attend. Tom was very generous and was loved by many, including his late father, Joseph Arena; his mom, Elizabeth Arena, and his brothers’ families; Rocco and Nancy, Joseph and Donna, and Michael and Diana Arena. Tom was a caring uncle and had a very special place in his heart for his nieces, Sarah, Christen, Katherine, and Natalia. Tom lived his life with determination, dignity and an inner strength that was an inspiration to us all. In lieu of flowers, the family asks that donations be made to: MDA, 3300 E. Sunrise Drive, Tucson, Ariz. 85718 (800-223-6011); mdausa.org.